Last winter in Alexandria while driving in my car to meet some people at a home for sale at Lake Brophy I passed a guy out for a bike ride along County Road 82 and I noticed that the bike had huge tires. I was unaware that there were bikes designed for biking on snow. After doing some research, talking with Jake at Jake’s Bikes and deciding I’d like to spend more time outdoors during the winter months, I cancelled my health club membership and purchased a fat tire bike from Jake’s. My bike is made by Salsa and they are based in the Twin Cities. I love the bike. It is fun to ride and I am especially enjoying rides on the Central Lakes Trail. Except for the times when snowmobiles pass me, it is very peaceful and it is tough to beat the scenery. I highly recommend it if you are looking for something fun to do during the winter months. Visit Jake’s and if they have one in stock they will let you take it for a test ride. 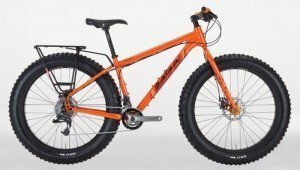 Recently saw something like this bike with the fat tires riding along the beach on Hilton Head Island, SC. At the time thought it was some sort of specialty sand tire…might be the same thing. Nice video btw. They would be a blast on the beach and it most likely what you saw as when I started looking into them I discovered they were popular on beaches. If you search for ‘fat tire bike sand’ on YouTube you will find some videos. Here is one example, http://www.youtube.com/watch?v=tZn04EqAfJk . I bought mine late in the fall and it was a lot of fun to ride without snow or sand. Thanks for visiting my site and for taking the time to comment. How is the market in Hilton Head? I just found your blog and wonderful R.E. page from your comment today on Kristi’s blog. I am crazy about the idea of a beach bike – this would work great for me here in Puerto Vallarta, Mexico since I live near the beach and could ride for miles. Also I am most impressed by your R.E. site, I’m an old agent that ran away to Mexico in 1997. I would like to use your site to educate my other daughter Heidi – a Broker in the Scottsdale, Phoenix area on the joy she would experience if she would follow in your footsteps with a site like yours. Are you on Facebook? Let’s be friends. Thank you for your kind words Jules. I appreciate your comments, especially since they were my favorite kind (positive). I haven’t tried my bike on a beach yet but imagine it’d be a blast as it was fall her in MN when I bought mine & it was a lot of fun being able to ride effortlessly over grass, dirt, rocks, etc.